The greatest joy we deliver things made with your own hands. To please yourself and your friends very simply – the technique of weaving of laces requires certain skills, but opens a boundless field for imagination and creativity. Two-tone laces can become a bright accessory for mobile phone or bag and an ornament, turned into a summer bracelet or necklace on her neck. Select two threads, bright and dark, or contrasting thread colors. Blue goes well with orange, red with green, purple and yellow. 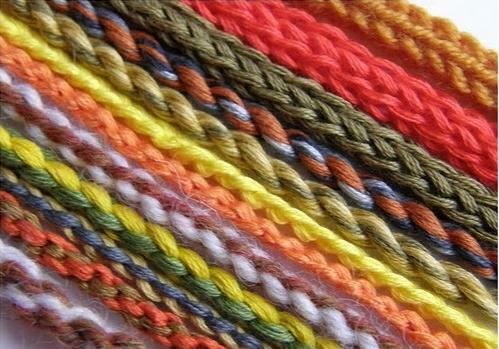 An interesting effect is the use of two different types of threads, assuming that they are the same thickness. Yarn and floss are combined with a broad leather or rubber cord, folded double or triple satin ribbons or beads. Don't be afraid to experiment! You will do even laces for shoes or saturated colors made of fluorescent material that will glow in the dark. If you are using laces with a pattern, then it pick a solid yarn. Take two bright thread (same color) and two dark (different color). Secure them together with pins or tying the end knot. Put one dark (one color) thread in the front, and the second dark back. One light (other color) yarn with the left hand, the second light from the right. Swap the dark filament counterclockwise. Swap the bright thread in a counterclockwise direction, while perevela them between the dark. Thus, the first dark thread that you originally put in the front is under a twisted light, and the second is dark over them. Swap dark thread so that light still remained on the left and right of them. Then swap the bright thread and move so on. Try not to pull thread too tightly, otherwise the cord will come out too thin and uneven. Thus a certain tension be maintained must, to avoid the gaps between the loops. Then the work will look sloppy. The finished cord should be smooth, dense and round. In the formation of creases mash the lace between fingers or roll between your hands. Now you only have to decorate the cord pendants, chunky beads or sequins. It requires a certain concentration, while Your actions will not be automatic. Choose a thick thread, to Your decoration of laces didn't look too thin. If you use floss or narrow ribbon, fold them in two or three times.